What explains Modi\'s inconsistency on Pakistan? Will NSAs call the shots from now on? 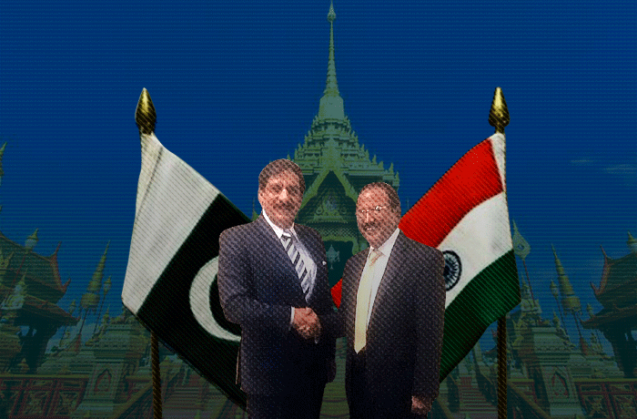 India's National Security Adviser Ajit Doval and his Pakistani counterpart Lt. General Nasir Janjua met in Bangkok on 6 December. The Foreign Secretaries of the two countries accompanied them. A brief Joint Statement issued after the meeting mentioned that the discussions, "covered peace and security, terrorism, Jammu and Kashmir, and other issues, including tranquility along the LoC". This meeting leads to several inescapable conclusions and raises a number of urgent questions. Irrespective of the positive slant the government's and the BJP's spin doctors seek to give, the Pakistani generals have had their way. The Ufa Joint Statement text had made it clear that the two NSAs would meet in Delhi to discuss all aspects of terrorism. The Pakistani generals did not want the NSAs meeting to exclusively focus on terrorism for that would have put the Pakistan Army in the dock. Hence, they desired the Jammu and Kashmir issue be included in the talks though the Ufa Joint Statement did not mention it. In August, India correctly rejected the Pakistani demand. That led to Pakistan cancelling the then NSA Sartaj Aziz's visit to Delhi. What India refused to do in August it agreed to do in December. To the Pakistani generals, Modi's concessions both on substance and the venue of the meeting would not be a sign of maturity but a signal of weakness. They will look upon him as yet another Indian politician without the stamina to stay the course and resist pressure. This will only encourage them to be adventurist. That is the experience of the last seven decades which Modi and his advisers have simply overlooked. The search for peace cannot be through concessions that whet the generals' appetite and stereotyped image of Indian leaders. While Pakistan's Ufa commitments are now dead Modi will no doubt hold firm to his Ufa commitment-to visit Pakistan for the Saarc summit in Islamabad next year. Perhaps the key to understanding Modi's inconsistent actions on Pakistan lies in his desire to make history with Pakistan and achieve great progress in the bilateral relations during that visit. Certainly, the track record of all his foreign visits shows that he does not want them to be, as I noted in an article in Catch last week, routine or timid. The Pakistani generals know this and are becoming intransigent. The Composite Dialogue process with Pakistan was co-ordinated by the Foreign Secretaries. They also had the responsibility to discuss the subjects of Peace and Security and Jammu and Kashmir. They had therefore a pivotal role in guiding bilateral interaction under the directions of the political leadership in India and the influence of the generals in Pakistan. It would seem that the Foreign Secretaries are now to play second fiddle to the National Security Advisers, who will be the main official interlocutors. If this is so, it is only a reflection of the waning position of the Ministry of External Affairs. Of course Modi holds Foreign Secretary Jaishankar in high esteem but the diminishing of the MEA as an institution cannot but have an adverse impact on the role of the Foreign Secretary whoever may hold that job. Interestingly the NSAs delegation consisted of only PMO officials except for the Foreign Secretary. The Bangkok statement mentions some but not all the issues taken up in the NSAs meeting. Doval would have no doubt pressed Janjua that Pakistan should curb the Lashkar-e-Tayyeba. It would be unrealistic though to expect Pakistan to give up the basic element of its security doctrine against India. It may however calibrate it though some in its establishment may, having succeeded in pushing Modi, seek to test him further through terrorist acts. Was anything new discussed on Jammu and Kashmir? Does Modi wish to take forward the four point approach pursued on the back channel by Manmohan Singh? The country needs to be taken in confidence on this most important matter. The stabilisation of the LoC is important for both countries as the welfare of the civilian populations astride it is at stake. Were assurances received from Pakistan that it would give up pushing terrorists which would help in a less volatile situation? Did the Pakistani NSA raise the withdrawal of forces from Siachen? If so, did the Indian side bluntly tell them that the Siachen issue was now off the table? Certainly national interest demands that such an approach be taken. These are all questions that need urgent answers. There is also the question of how the bilateral engagement will be taken ahead. Pakistan wants the resumption of the Composite Dialogue. Has any view been taken by Modi on this issue? The Bangkok statement itself is vague on this matter. It merely states that the constructive engagement will continue. The Bangkok engagement has another noteworthy aspect. Indian and Pakistani Foreign Secretaries have met on the sidelines of summits. This is the first time perhaps a regular meeting has taken place in a third country where the NSAs led the teams of which the Foreign Secretaries were members. This was obviously done to enable Pakistan to bypass the Hurriyat issue. This was in itself a concession to the Generals. The question is will Pakistan official visitors ignore the Hurriyat in future or will meetings henceforth be held in third countries? The government needs to clarify this point as well. External Affairs Minister Sushma Swaraj will now no doubt visit Pakistan to take part in a regional ministerial meeting on Afghanistan. Will her own bilateral interactions with the Pakistani leadership on the sidelines of the meeting be confined to Afghanistan? As this is unlikely what is the message will she give to the Pakistani leadership? It will be appropriate if she publicly emphasises that the bilateral engagement is predicated on Pakistan ensuring that no terrorism against India takes place from its soil. The generals must be smiling with satisfaction in Rawalpindi, almost certainly thinking that they have the measure of Modi. They know that he has, like his predecessor, shown no capacity for a firm, consistent and patient policy approach. This is negative for Indian interests for the lesson of history is that India should not be reactive to Pakistan but always be in the driver's seat.